"Find a Group" Surviving the Holidays event listing on our website The DVD offers optional subtitles to minister to hearing-impaired participants. The Survival Guide includes a note-taking section, more than 30 daily devotions and other resources to minister to a hurting person during the holidays. The Leader’s Guide features suggestions on maximizing community exposure and publicity for your seminar, a guide for leading the holiday group discussion time and information on accessing valuable online tools for hosting an event. 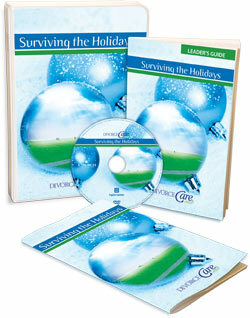 Each person who attends your holiday seminar should receive a Survival Guide to take home. Additional Holiday Survival Guides are available for purchase (minimum quantity of 5).